Perhaps, the situation of the children in Sub-sahara Africa typifies this. Nearly half of all children in sub-Saharan Africa are living in extreme poverty, according to joint UNICEF-World Bank report released in 2016. The figures showed that almost 385 million children worldwide survive on less than $1.90 (£1.50) a day, the World Bank international poverty line. The report while displaying gory picture of the impact of extreme poverty, stated that it leads to stunted development, limited future productivity as adults, and intergenerational transmission of poverty. The figures based on the data which represents 84 per cent of the developing world’s population also indicated that much work will be needed to meet the Sustainable Development Goals (SDGs) of eradicating extreme poverty by 2030. Children are disproportionately affected by extreme poverty as they make up just a third of the population studied, but comprise half of the extreme poor. They are twice as likely as adults to be living on less than $1.90 a day, the report claimed, with 19.5 per cent of children in developing countries living in extremely poor households, compared to just 9.2 per cent of adults. Justin Forsyth, the UNICEF’s Deputy Executive Director, reacting to the report had noted, “It’s almost a double blow. “Firstly, that children are twice as likely as an adult to live in extreme poverty, but also that children are much less likely than an adult to be able to cope with extreme poverty because of stunting, infant mortality, and early childhood development,” Forsyth added. Barely two years after this report, the condition of Nigerian children is despicably growing worse, a United Nations International Children’s Emergency Fund (UNICEF) reports revealed on Monday. With more than four million unimmunised children and poor access to clean water and sanitation which put children’s health at risk, the country has one of the world’s highest rate of maternal, child and infant mortality, the UNICEF reported. Consequently, the United Nation’s agency has called on global leaders to make commitment to intensify efforts in fulfilling children’s rights, as the world marked International Children’s Day. Reflecting, Mohamed Fall, UNICEF Nigeria Representative, said there is need for the safety and future of children to be guaranteed. Fall’s views were contained in a two separate statements made available to DAILY INDEPENDENT signed by Geoffrey Njoku, UNICEF Communication Specialist and Blessing Ejiofor, Communication Officer respectively. “A lot has been achieved, but there is still much to be done to ensure that Nigerian children benefit from advances in child rights. 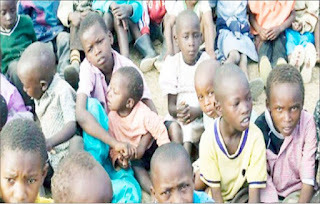 At the moment, too many children are being left behind, and we need to reach them,” the UNICEF Nigeria Representative said. Fall stressed that Nigeria’s stunted growth among children is the second highest in the world, with 16.5 million affected and acute malnutrition is high, with an estimated 2.6 million children severely acutely malnourished. According to him, “Nigeria has the world’s highest number of out-of-school children, and one of its highest rates of maternal, child and infant mortality. He added, “Diseases like pneumonia, diarrhoea, and malaria, combined with underlying malnutrition, are responsible for most of the deaths among infants and children in Nigeria. This World Children’s Day, we must recommit to children, knowing that for Nigeria to achieve the Sustainable Development Goals by 2030, we must invest in long-lasting institutional and community -based systems and policies for children’s survival, growth and development,” said Fall. Meanwhile, UNICEF has lighted one of Nigeria’s most iconic landmarks blue to celebrate World Children’s Day, Tuesday, as a symbol of the need to re-commit to children’s rights and well-being. The event marked the importance of drawing leaders’ attention to children’s rights in Nigeria and around the world. A statement on Monday made available to DAILY INDEPENDENT which was jointly signed by Geoffrey Njoku, UNICEF Communications Specialist and Eliana Drakopoulos, UNICEF Chief of Communications said the Abuja’s City Gate will joined the Empire State Building in New York, Sydney Opera House in Australia, Petra in Jordan, the Beijing National Aquatics Center and Water Cube in China, and Eden Park in New Zealand – all national landmarks that were lit blue for children.